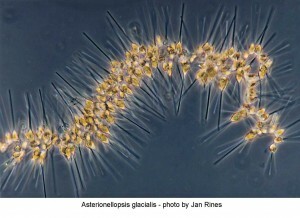 A microscopic image of a marine diatoms much like the one Jim used to study. The scale change between the this image and the satellite image below is 10 to the eleventh power. As a graduate student, I studied microscopic plants growing in small flasks to understand the conditions that favored their growth. My goal was to use these results to predict plant growth in the ocean, or at least in the local bay. I believed that this was important research, because microscopic plants form the base of ocean food webs and ultimately determine how much life can live in the sea. I was getting great results, and my adviser and I were quite pleased with my progress. One day, my wife asked a disturbing question: “Why do you believe that what happens in your little flasks has anything to do with what actually happens in the ocean?” I didn’t have a good answer but wanted one. For my first job, I worked with a team of ocean scientists that conducted research in coastal waters off Georgia. Now, I was actually making measurements from which I believed I could understand microscopic plant growth in coastal waters of the real ocean. But, I was still troubled by what a small area of the vast ocean one could sample by lowering water bottles from a ship. Did the stations where I focused my measurements really represent the ocean or even of the complex coastal waters of our region? I tried to convince myself that the answer was “yes”, but was frustrated because I really didn’t know. Shortly thereafter, I met Chuck from NASA. Chuck was working on a new approach to estimate the distribution and abundance of microscopic plants in the ocean by measuring the color of ocean waters. These measurements were made by a complex instrument flown at high altitude in a NASA research airplane. Chuck wanted to cooperate with a research team that would make measurements from a ship that was in the field of view of his aircraft measurements. Chuck needed the ship data to demonstrate that his aircraft measurements were accurate. Our group wanted the aircraft measurements to determine how well the limited coverage of our ship measurements represented the conditions of a much larger region. And so we formed a partnership. Our first experiment was a great success. The aircraft flew on a beautiful, clear day. Our ship was in the right place and in the middle of a very interesting feature that the aircraft measurements showed extended for many miles along the edge of the Gulf Stream. But the results were also frustrating. The aircraft measurements also showed that the conditions both seaward and shoreward of our interesting feature were very different. So, now what? From the point of view of understanding the distribution of microscopic plants, how could we get an even broader perspective than was possible from an airplane? This satellite image shows the annual average phytoplankton chlorophyll (a measure of phytoplankton biomass) in the global ocean. 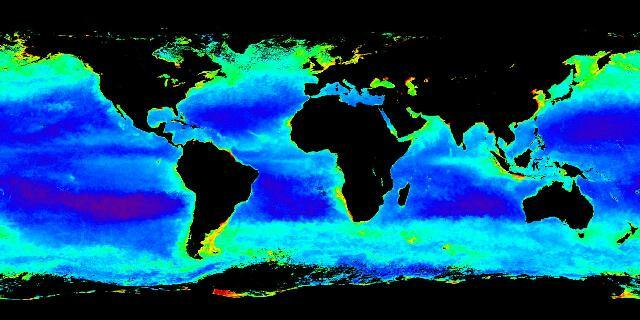 It was made by averaging all of the data collected by the SeaWiF\'s satellite sensor during a single year. To make a long story short, NASA launched a satellite in 1978 that carried an instrument similar to the one in Chuck’s airplane. It took many years to understand the data from this instrument and from other similar instruments launched subsequently; and for the computer technology to catch up, so that global data could be processed and efficiently distributed to scientists. In 1986, I was now working at NASA Headquarters as a program manager involved with supporting researchers developing this new field of satellite oceanography. One day, Chuck and his colleagues visited my office and brought a satellite image that many believe was a key milestone in biological oceanography. By merging the data from many satellite measurements collected during an entire month, Chuck and his colleagues made a color picture that showed the distribution of microscope plants in the entire North Atlantic ocean during the peak of the spring growth season. The results were stunning. One could clearly see where the productivity of the sea was greatest and where it was very low. Furthermore, subsequent images revealed the seasonal changes that occurred throughout the global ocean, as well as the impact of major ocean disturbances such as El Nino. 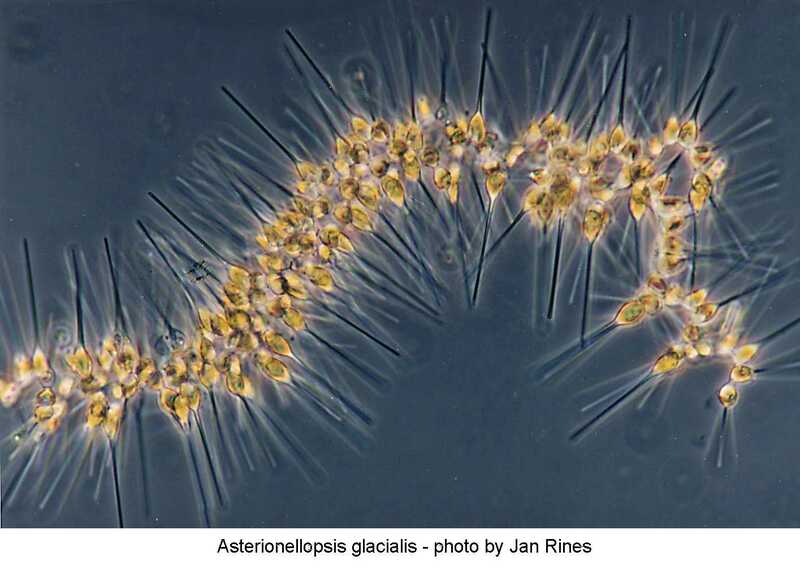 Biological oceanographers finally had a tool to globally observe at least one important component of ocean ecosystems. And by comparing the satellite results with models and with data collected in the ocean, biological oceanographers could finally make a convincing argument that what we learned studying microscope plants in small flasks did in fact have something to do with what actually happens in the global ocean.